What is Causing My Gutters to Leak? Do the gutters on your home leak every time it rains? It could present some potentially catastrophic problems for your home. At best, it’ll leave standing water pooling around the foundation of your house, and at worst, that water could end up causing serious foundation issues. Prevent leaky gutters by addressing the common causes of them. Here are a few common causes of leaky gutters. One of the biggest causes of gutter leaks is clogs. Over time, leaves, sticks, dirt, and other debris can build up in your home’s gutters and send water spilling out over the sides. The only way to prevent this from happening is to clean your gutters regularly. Have your gutters cleaned by a professional to stop clogs from causing leaks to occur. Gutters are usually very study and won’t crack under even the toughest conditions. 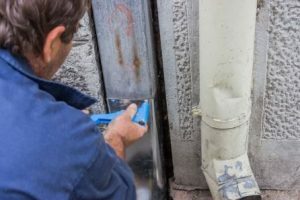 Nevertheless, once they start to get older, it’s not uncommon to see gutters start to fall apart. They might crack in certain places. They might also get holes in them. These holes and cracks can send water shooting out of your home’s gutters and stop the gutters from doing their jobs. You’ll need to either have your gutters patched up or replace them altogether. When gutters are installed on your home, they need to be sloped so that they send water in the direction of your downspouts. Improperly sloped gutters will stop rainwater from flowing in the right direction and cause leaks. If you see that water is just sitting in your gutters and you don’t have any clogs, have a professional check the slope of them. That could be your issue. If you’re experiencing gutter leaks, Roofing by Bruce can come and see what the problem is. We can provide you with new gutters, gutter repairs, gutter cleaning, gutter re-pitching, and more. Call us at 570-424-8891 to get the gutter maintenance you need.